It won’t be long before our college-aged readers head back to school for yet another year of studying and general devotion to all things academic. To make the next couple semesters a little more geeky, we’re rounding up our favorite dorm room hacks that would be perfect for the residence halls. A pair of MIT students created the “iDoor.” Not only can you activate this hydraulic door mod with an iPhone, but it also has a secret knock detector for admittance. Another pair of MIT students tricked out their dorm room with MIDAS, a centralized dorm room automation system. It’s complete with an over-the-top “party mode,” demoed in the video above. Our friend Becky Stern shows you how to trick out your boring couch with some EL wire. Space is scarce in many dorm rooms, so why not make the best of it? This bunk couch, which was recently spotted on i3 Detroit’s Facebook page, would be perfect for video gaming or movie watching. Just watch your head. What better way to show off your impeccable taste in music than using this speaker to blast out spherical sound waves? The project is from our own Sean Michael Ragan and it also serves as a nice piece of decor. Of course, since there’s always some academic interest in the consumption of alcoholic beverages, here’s a robot that pours the perfect glass of beer. Just don’t let your RA find out about it. When you’re cramming for an exam or trying to get some sleep and the party is happening right outside your window, this automatic window closer can take care of the situation without any intervention from you. If you’re looking build some of your own inexpensive furniture, the Rok-Bak chair is the perfect choice for studying in comfort. Here’s another stylish chair designed from plywood. Living with others is a fact of life for many college students. 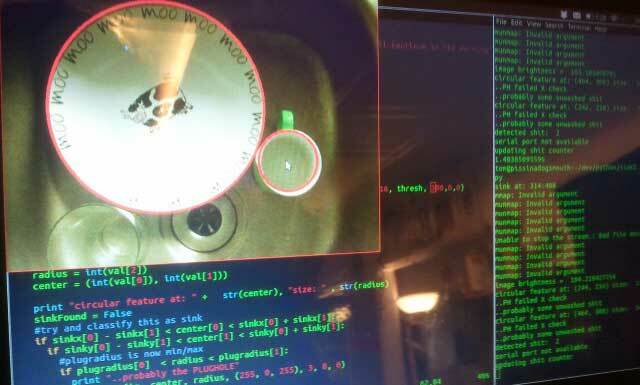 Make sure that everyone in your suite does their fair share of the dishes with this BeagleBone-based dirty dish detector.